The Best Calming Treats for Dogs, Below. What to look for in Calming Treats for Dogs? What Can I Give My Dog To Calm Him Down? Do Calming Dog Treats Work? 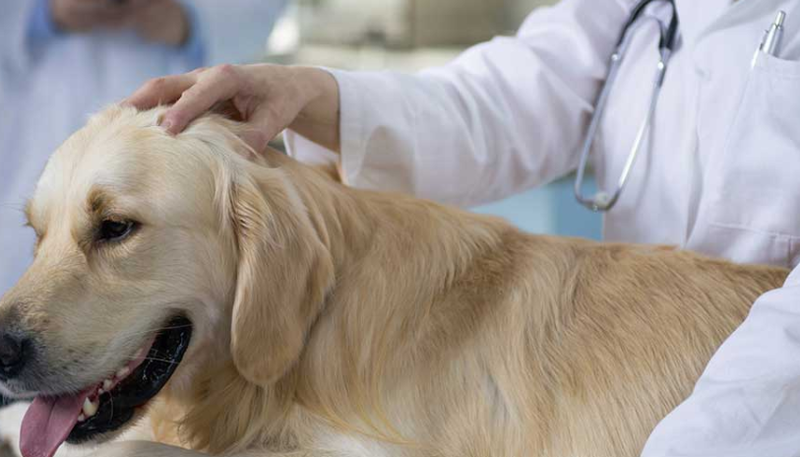 Are Dog Calming Treats Safe? 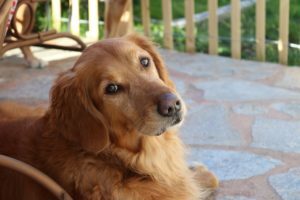 What is in Dog Calming Treats? What About Calming Dog Treats for Little Dogs? Best Dog Calming Treats for Air Travel? Every pet owner knows that sometimes, it can be hard to keep our pets at bay. That’s why many owners turn to purchase calming treats for dogs regularly. 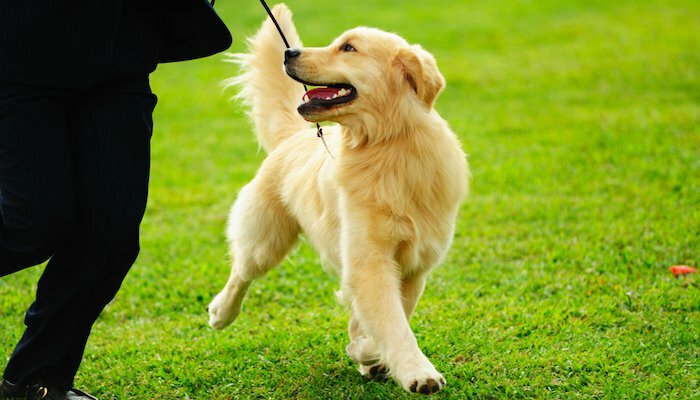 Dogs that can be hyperactive, energetic and excited are often hard to control. This behavior can be a by-product of anxiety, a recent illness or a variety of other things. Regardless, it’s important to help keep your pets healthy when they’re having trouble. Calming treats are usually given two to three times a day and contain a myriad of healthy, organic ingredients. These ingredients can include hemp oil, vitamins, roots, chamomile and much more. These ingredients help with anxiety, general health, digestion, stress, nausea and a variety of other things. That’s why it can be a good idea to consider including these treats in your pup’s diet. We spent countless hours trying to find the best calming treats that have proven to be effective for both pets and owners. The products we found have been made by quality companies, and have a good quality reputation on the market. That’s why we hope that you will find something that can help your pup on the list below! Did you know that chewing can really help ease anxiety in dogs? Relaxing chew treats are great, but we also recommend indestructible dog toys between treats and meals for diet control. Below we have the full list of the 10 products that we found to be the most effective calming treats for dogs. All of them have reliable reviews, plenty of satisfied customers and plenty of testimonies from happy dog owners. Many pups have benefited from using the treats we will recommend, and we hope that your pup will too! 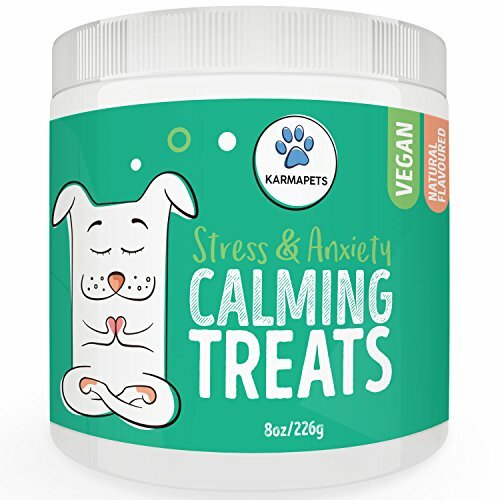 The KarmaPets Calming Treats has definitely been one of the most successful calming dog snacks on the market so far. Having a fantastic set of reviews, it’s hard to see a reason that would not encourage you to buy these training treats for your anxious pet. These little dog foods are highly affordable, are packaged in a friendly, simple way and have been proven to work for dozens of dog owners already. The treats will also do their job balancing your pet’s brain chemistry, and will get the chance to see your pup less anxious and stressed during daily activities. 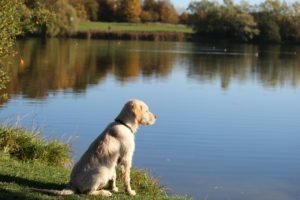 KarmaPets definitely knows how to make a pup calm, while still letting them enjoy everyday life, just with a happier, more relaxed state of mind. If your dog is suffering from pain at the moment, you may wish to invest in a pet dog bicycle trailer until your pup is better. You will be getting about 8 oz. worth of treats within this pack, which equals to about 105 treats, which is the ideal monthly amount for any dog. The jar is also recyclable and can be easily re-sealed to help encourage longer shelf-life. The KarmaPets treats are also 100% vegan and organic, which means that they only include natural supplements such as: passion flower, organic hemp oil, and chamomile extract. The treats themselves include ingredients such as organic hemp oil and valerian root. These ingredients are known for helping reduce stress in your pups, making them calmer without triggering drowsiness and fatigue. If you find yourself frustrated by your pet barking, biting, whining or scratching when under stress, then these treats might just be the solution you’ve been looking for. Not only do they help keep your pet’s anxiety at bay, but they also help calm them down during travels, walks or social events. Another way you can help this is with a harness for dogs. The treats are made from safe and organic supplements that are tested and taken from GMO-free environments. This ensures that your pet won’t be ingesting any pesticides, additives, or herbicides. Zesty Paws is a brand that has collaborated with the pet industry’s brightest minds to help give their customers the best, most valuable products. They put their pride aside, and managed to come up with the ideal treat recipe that has the best from all worlds. They also stay on the top with all the current breakthroughs, incorporating them into their treats every opportunity they get. Everyone at Zesty Paws is a devoted pet enthusiast, and the results that have been seen among pups with anxiety after using the product speak for themselves. All the ingredients they use are listed clearly on their packaging, and nothing is omitted. This practice has made Zesty Paws a trustworthy, straightforward brand that doesn’t hide anything from their customers. The Zesty Paws calming soft chews for dogs have been the ideal solution to many anxiety-packed pet homes, and they continue to be so. Their goal is to help pet owners create long-lasting and happy memories with our pets, and they certainly manage to do so with their calming bites. If you have a restless pup, these chews will sort out the problem within days. The Zesty Paws calming soft chews come in a compact, round cylinder packaging that contains about 90 chews. Each chew weighs about 4g, and the container should last 1-2 months with regular use. Depending if your dog is smaller or bigger, the estimated time that the chews may finish may vary. To help your pets enjoy this healthy treat more, Zesty Paws decided to give it a light turkey flavor. A flavor that is made with organic ingredients that is safe to consume by all dog breeds and age groups. 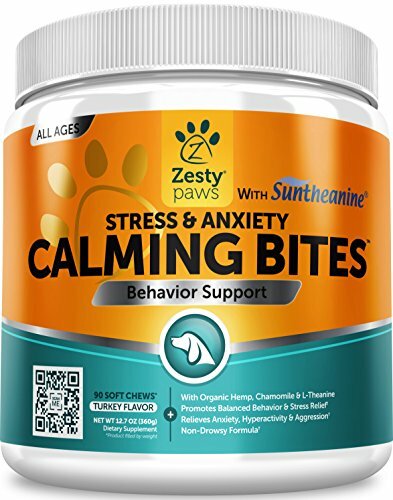 Zesty Paws calming soft chews included suntheanine within these chews to help your pup with stress relief during their day. Anxiety can be tough to handle, especially for pets, and this pure, natural, additional ingredient helps stimulate brain waves to help your pet stay calm. 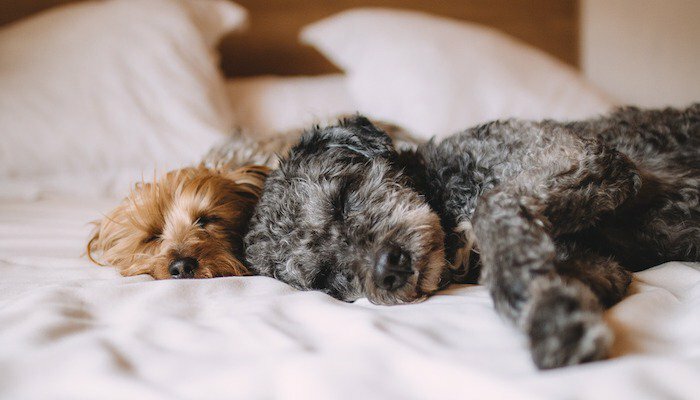 The best thing: your dog won’t get drowsy, either. The treats help prevent excessive barking that can be stimulated by anxiety, aggressive and/or agitated behavior in general and other hyperactive qualities. All the soothing ingredients included within the treats are healthy, organic, and will cause your pet to relive stress in non-hyperactive ways. The treats are 100% safe and have proven to work perfectly when pets are faced with stressful situations. Whether those situations include firework noises, car rides, dog parks or crowded places, these treats will help keep your pet safe by keeping them with a calm behavior and collected. Pawlife wants us to be able to enjoy life with our furry friends for as long as possible. That, of course, means that we have to watch out what we give them and what we include in their diet. Whether that concerns regular dog food or supplements. Pawlife has been one of the first brands to realize that pets need just as much care and treatment as humans do. Since humans believe in healthy, active lifestyles, the same should apply for our pups, and it does. That’s why it’s important to take notice of what we feed them. Quality natural dogdo friendly ingredients are important, and Pawlife makes sure to include all of them within their treat mixes. 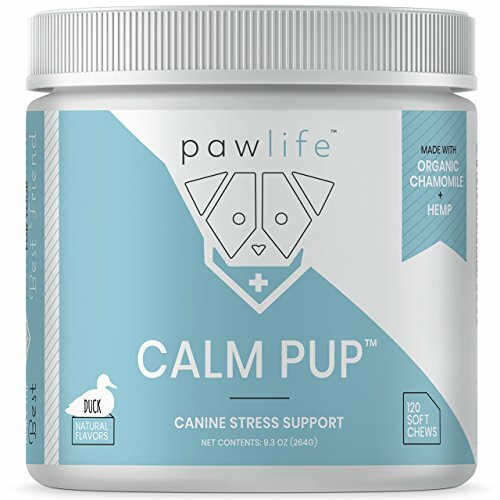 Whether that’s vitamins or calming organic nutrients, the Pawlife Calm behavior Pup chews will be able to keep any anxious dogs at bay. Pawlife wants to help pet owners get as much quality time with their pets as they can. They help us with that by providing the market with these reliable chews. Chews that have already helped dozens of dogs worldwide, both small and big, and of all dog breeds. The Pawlife pack includes about 120 treats, which is quite a bit more that in the previous products we listed. This means that the pack can last for about a month and a half with regular use. The packaging itself is simple, straightforward, and lists all the main ingredients from the get-go. To help reduce your pup’s anxiety problems in the most stress-free way possible, the Pawlife chews have been given a duck flavor. This means that your dog shouldn’t be fussy about the taste since all the natural organic ingredients will be masked under the duck flavor. The chews include quality ingredients such as organic hemp and organic chamomile, which are known to help relieve stress and frustration in pets. The bite-sized chews also include other ingredients, such as passionflower, valerian root, l-trytophan and an organic ginger root. This mild and relaxing mix will help alleviate all symptoms of aggressive behavior, anxiety and agitation that can be caused by loud noises, strangers and nervous encounters. If you know your dog will be stressed later in the day, we recommend giving the treats a few hours before the event occurs. These treats are a natural calming aid, and if you or your pup are not satisfied, you will get 100% money back guarantee. 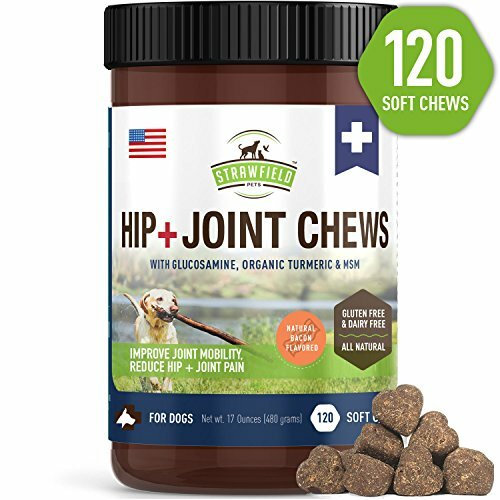 The chews also don’t have any added fillers, and are treats made in USA under strict USA health guidelines that help ensure we get only the best supplements for our pets. PetiPet has a crystal clear view on what they want and don’t want to be included in their products. They want their bars to be organic, fresh and natural. This means that their treats don’t include any fillers such as soy or wheat, or by-products in general. Your pup will only be getting the full nutritious value of the calming bars themselves that will help keep them anxiety-free, ready to enjoy life. Their goal is to not only make our pets less stressed but to provide them with all the necessary nutrients that they may need to stay healthy all day. Thanks to their policy of only having limited ingredients within their bars, you will be able to rest assured that your pup is getting the best. All the products listed on the package are natural, well-known, and don’t include any fillers or harmful chemical compounds, sweeteners and the alike. With a mix of herbs, vegetable of fruits (such as watermelon), you will find it hard to find chews that will rival the PetiPets anywhere. The PetiPets come in a small, easy-to-use plastic bag that can be put into any dog backpack or purse when going on trips. It will fit anywhere and contains about 180 bars of human grade treats. This means that this pack should last you at least two months with regular use of the suggested doses! It’s definitely a fantastic investment for the price and quality of the product. With these stress-relieving treats, your pet will get the best from all the herbs, fruits, vegetables and other safe supplements. They will not only help your pet with anxiety, but will make them less irritable, less aggressive, and more sociable. The PetiPets are made from natural dog friendly ingredients such as carrots, apples, chamomile, organic hemp, passion flower, and, curiously, baobab trees, which seem to have roots that store lots of nutritious content. Regardless, these treats are definitely both meant to ease your pet’s anxiety, as well as making them healthier for the day. Relieves separation anxiety, loud, aggressive behavior, loud noise scares like fireworks and lightning, as well as aggression against other dogs and/or people. If you are taking your pet to a celebration such as a party or halloween trick or treating, calming treats can help you ease any anxiety symptoms. Not got your dog a costume yet? Try these awesome Halloween costumes for dogs! 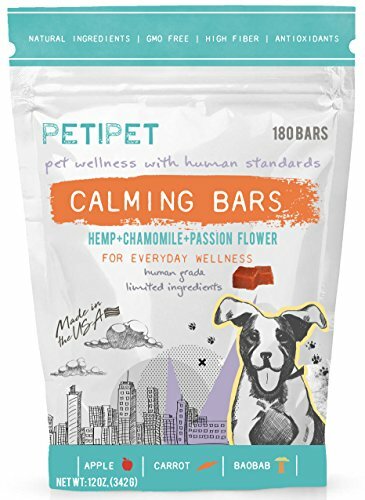 Many pet owners favor the PetiPet bars since they help keep their pups calm, and don’t make them sluggish or looking and/or feeling ‘drugged’ in any way. That’s definitely a huge plus, since the ingredients will only affect your dogs in the positive manner. Healthy Shelby has been very confident about their products since they first came on the market in the past few years. Despite being a relatively new company, they have quickly established a reputable name among all the other big shots on the market. The treats have gotten dozens of positive reviews, and plenty of pet owners praise the fact that the treats not only help with the anxiety of the pets, but help them be more healthy with a balanced vitamin intake. All of the products used in the Healthy Shelby treats are natural, and made in the USA. If you find yourself constantly trying to calm your dog, or trying to reassure him/her, then pop one of these treats into their mouth may make them much less prone to be so stressed. Everyday life will become more enjoyable, more quiet moments, and your pet will finally be able to relax with you. You will be able to say goodbye to teething, biting, and loud barks when your pup encounters strangers. The Healthy Shelby treats come in a well-sized plastic tin that features about 100 chews. This is definitely a great investment if you want to help your pup’s anxiety go away for the month. The back of the tin also has a comprehensive easy-to-read guide about how much chews you should give per the weight of your dog. Healthy Shelby is known for having lots of vitamins within their treats. The vitamins help keep your pets stay healthy, despite also reducing their anxiety. This means less frequent visits to the vet, which is an extra plus. These chews contain a variety of ingredients that help your pet stay calm during stressful situations. Ingredients such as: flower powder, passion flower powder, ginger root powder, chamomile and much more. All of which are meant to calm down your pet, without making them feel sluggish or drowsy. The treats are meant to prevent your dog from feeling agitated, shaking, being sick before stressful events, or just getting scared in general. Giving them the treat about half an hour before the stressful event occurs should keep them and relaxed. The Healthy Shelby treat are 100% safe and are made right here in the USA without using imported goods. This natural method of calming your pet will help both of you enjoy the day more, especially if your pup is dealing with severe separation anxiety. Hanzi Pets is a brand that has taken it upon them to provide us with products that promote healthy, stress-free solutions to lasting problems. Anxiety and stress affects many dogs for many different reasons, and it can be hard to cope with your pet when they are agitated and not their usual self. That’s why Hanzi Pets has made it their mission to provide pet owners with a long-lasting solution. 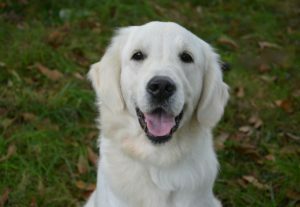 They want to make the best treats, so that owners and dogs can once again enjoy a peaceful home. They only use quality ingredients and supplements within their products that are in their top criteria. If the ingredients don’t excel, they will not be used, and that’s why the Tru-Calm treats have proven to be so popular. They are effective, inexpensive, and Hanzi believes in giving their customers full-satisfaction. That’s why all of their recipes are listed right there on the front of the package, to help build a relationship of trust with the pet owners. Hanzi is definitely a reliable brand that has gotten much love over the past few years, and continues to do so as they release more reliable products. The Hanzi treats are packed in a simple plastic tin that contains about 120 of said chews. This is definitely a good amount to invest in every month since both big and smaller dogs seem to love the chews and they disappear quickly! The chews are small, and have a natural duck flavor to ensure that your dog eats them quickly and without any fuss. A lot of pups seem to adore this flavor, and many pet owners are eternally grateful to Hanzi for making treats that only are helpful, but are enjoyed by the dog, too. The treats include a variety of different ingredients, ranging from organic chamomile to valerian roots, l-trytophan and organic ginger roots. The treats have very mild sedative effects so that your pet can stay relaxed during episodes of indigestion, gas or vomiting. There is no doubt that the treats are exceptionally helpful during difficult periods like these, since they can help the owner and pet take control of the situation. The chews only feature reliable supplements, like l-trytophan, that helps support a stress-free mood during uncomfortable and frustrating situations outside of the comfort zone that your pup my encounter. Ingredients such as the ginger root also help with nausea and motion sickness, storms and are 100% organic and natural. Lively Pets’s goal is to provide pet owners worldwide with a long-lasting solution to pets that suffer from anxiety. 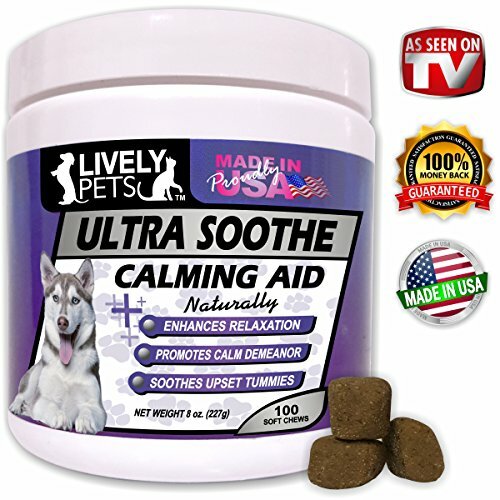 Whether that’s separation anxiety, aggression or just agitation in general, this calming aid for dogs has been known to soothe and calm almost every pup. They have one of the highest success rates on this list, and are definitely worth investing in, even if it’s just to give them a go. With over 300 positive reviews, it’s easy to see that many owners turn to this brand when it comes down to taking care of their pets. Supplying our furry friends with quality treats that can help is vital, and getting them from an official, reputable brand is essential. That’s why Lively Pets calming aid for dogs uses only organic and natural ingredients within their products. Their motto revolves around their company trying to help pet owners love their pets for longer, and they certainly manage to encourage that with their treats. Lively Pets has only been on the market for a couple of years so far, but they have definitely already made a huge difference in many pet homes around the globe. The Lively Pets packaging is definitely one of the more out-going designs that we’ve seen so far. The bright purples and pinks definitely attract attention. There are about 100 chews included within the portable pocket-sized tin. It will easily fit into any backpack, to ensure that you keep your pet calm and collected wherever you go, no matter what the situation. Thanks to the passion flower supplement for dogs included within the chews, your pet will be able to remain calm during all encounters. This organic ingredient will help reduce the nerve cell activity that usually occurs when pups jump into their fighting/aggressive mode. The main ingredients included within these chews are passion flower, chamomile, l-tryptophan and ginger root. All of these supplements will help naturally reduce the stress levels of your pup, keeping them calm and relaxed no matter where they are or what they are doing. The Lively Pets are known to reduce spasms and upset stomachs, as well as anxiety. If you know that your pup has trouble with spasms, gas pains or vomiting, it can be a great idea to invest in these chews to help relieve their pain from these symptoms as soon as possible. Lively Pets has also made sure to avoid using valerian root within this mix of chews, since some dogs don’t tolerate it well. If your pup gets an upset stomach quickly, then these chews may be ideal for them. Being a small, family-owned business, Strawfield Pets has undoubtedly come a very long way with their products. Not only are their chews safe and effective, but they are loved by both pet owners and pets alike. With dozens of reviews behind their back, Strawfield has definitely taken their time in making a safe, reliable treat recipe that suits the majority of our furry friends. This versatility of their chews is one of the reasons as to why so many pet owners flock to buy them. Especially owners that have multiple dogs within the same household, since these chews seem to work the best on a wide variety of dog breeds. No matter if your dog is suffering from separation anxiety, storm anxiety, hyperactive behavior, or is just generally afraid of vet visits and the outside world, then these treats will be the ideal solution. Especially dogs that come from shelters benefit greatly from eating these chews during their first few days in a new home. The treats come in a well-packaged plastic tin that can easily fit into any pocket or purse. The package contains about 120 soft chews for dogs and is a good investment in the long-run. Strawfield made sure to make their product 100% affordable and available, to ensure that keeping your pet healthy and satisfied doesn’t rob your budget. Since many pups seem to be fussy when it comes down to eating healthy treats, Strawfield decided to make the chews bacon flavored. It’s hard to find a dog that won’t jump circles around a bacon-flavored treat, and that’s also the case when it comes to these chews. The ingredients included within the Strawfield chews include an organic and healthy blend of relaxing herbs, such as a valerian root, chamomile root, ginger root and passion flower, as well as l-tryptophan. All of these ingredients are derived from USA soil and are manufactured in a sterile and monitored environment at the Strawfield headquarters. The treats are known to prevent your dog from getting anxiety no matter where they are or what they are doing. Some pups get stressed around strangers, while some get anxiety when a new pet enters the household. Whichever it is, the treats can greatly help calm your pup and keep them relaxed. The treats are made 100% in the USA and hundreds of customers have been satisfied with the results, as well as the pets with the taste. The chews have passed rigorous health and safety tests, and can be consumed by your pet without any worry. Plano Paws is a brand that likes to give and give back. That’s why with every Plano Paws product purchase; they donate a pound of their own dog food to dog shelters in need. 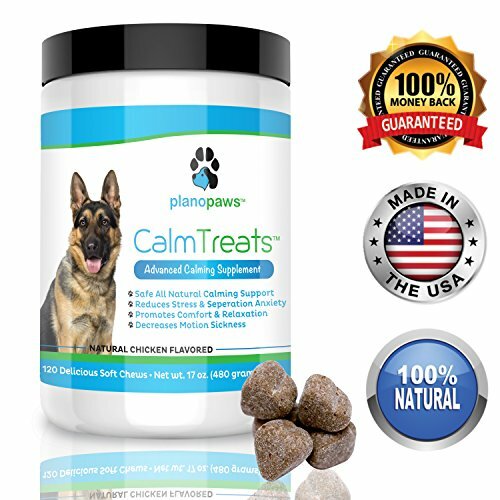 They know how difficult it can be to find a reliable product, and that’s why they put a lot of effort into making their CalmTreats. These chews were made with love, dedication, and caution. Their high-quality ingredients make their brand reliable, and well-loved by many owners. Especially since they offer the chews at a good, affordable, budget price that makes it easy for just about anyone to properly take care of their dogs. The Plano Paws dog relaxants come in a small, rounded, plastic case that is easy to carry-around no matter where you go. That way you can induce dog anxiety relief everywhere, anytime. The tin contains about 120 chews which is about 17 oz. Despite the dog relaxants being mainly for anxiety relief, they also have some nutritional value to help your pet stay healthy in their day-to-day life. There are no filler by-products included within the chews like corn, soy, wheat or sugars. In particular, the Plano Paws use 5 powerful ingredients that are known to help with anxiety relief, stress, frustration and agitation. These ingredients include valerian root, organic chamomile, organic ginger root, organic passion flower and l-tryptophan. All of these ingredients will help keep your pups calm, without the need to use dog calming pills or any other non-natural supplements. The chews help prevent your dog from stress and anxiety, excessive barking or licking, or from succumbing to motion sickness during travel. They will also help keep aggressive behavior down to a minimum, as well as hyperactivity and any destructive tendencies. The Plano Paw treats are 100% safe thanks to the company ensuring that all of their manufacturing sites are tested by third-party groups. These groups ensure the safe environment the snacks are produced in, and the integrity of the ingredients and specialists manufacturing the chews. No matter if you are trying to calm the pup you’ve had for years, or if you just recently rescued a puppy from a shelter, their anxiety can be hard to deal with. I Ruff You knows how exhausting it can be for owners to find a solution to this everlasting problem. That’s why they decided to supply the market with their own set of anxiety relief treats that help reduce anxiety and panic attacks in all breeds and dogs of all sizes. If you know that your pup is agitated during storms and tends to bark uncontrollably, then these chews should do the trick. Not only are they made from 100% organic ingredients, but they also help your dog avoid taking drugs or vet dog anxiety medications. These dog anxiety medication treats taste great, are easy to chew, and have great lasting effects when used regularly. They also don’t use any heat process when manufacturing their dog relaxants, to ensure that all the necessary vitamins and nutrients are left within the chews. That way , you pup gets the best from all of the ingredients within the bites. The I Ruff You package contains about 12.7 oz. worth of treats, which means that there are about 95 individual treats within the pack. All of their products are proudly manufactured in the USA and approved by USA safety standards of dogs health and safety organizations. All of the I Ruff You dog anxiety medication treats come in the shape of a heart, and are full of nutritious value despite only being supposed to help with anxiety. Thanks to the treats also providing nutrition to your pet, they will be able to stay healthier for longer, no matter their age. There are three main herbs that are included in this mix that are supposed to be the ideal prevention supplements. The ingredients include passion flower, ginger root, and chamomile. All which by default have calming qualities that won’t make your pup drowsy or sluggish by any means. Professionals oversee the production process of these chews, and a vet or animal dog food specialist approves every ingredient included. It’s important to give your pup treats that help support their diet, and these chews do exactly that. Since dogs can’t feed themselves, it often becomes our job to control and monitor their diet. This is a huge responsibility, and owners who are new to dog-care may find this responsibility very overwhelming. After all, the variety of choices is stunning, and each brand seems to have a reputable future and history behind their back. That’s why it’s important to make a purchase based on your dog’s needs, in particular. It’s important to take a trip to the doctor before and after you choose a product. This will ensure that your pup gets the best dog anxiety medication treatment for whatever they are going through. It’s important to also know what you are buying. All of the jargon listed on the front and back of the treat packages may make you weary. That’s why we took our time to research and explore all of the common ingredients included in calming treats for dogs. They are all explained below in a clear and concise way that will help you understand their properties so that you can make a fully informed decision when purchasing new chews for your pup. Packaging is one of the most vital parts of a product. It’s the design that attracts the customers, and the marketing listed on the front. When buying any food supplement for dogs, you should make sure that the packaging is well presented, and provides the full list of ingredients included within the chews. Usually, reputable brands include the full recipe of the anxiety remedy for pets on the back, while listing only the main key ingredients on the front. It’s important to invest in a brand that clearly states everything they put into their product. Carefully reading the packaging before investing will ensure that you won’t be paying for second-quality products that have a lot of filler ingredients. Filler ingredients include products such as soya, wheat and sugars. While these ingredients may not necessarily harm your dog, they don’t particularly help them in any way, either. Apart from filling them up and keeping their tummies satisfied for longer. That’s why many brands make sure to state on their packaging that their treats don’t include filler by-products. This ensures that your pup only gets the best, fully nutritious vitamins and herbs that they need. Depending on the brand, some treats will have specific flavors while some won’t. This all depends on the decision that the company makes. Sometimes the decision stems from wanting to keep the nutritional value of the dog anxiety medication treats without layering additional flavors. It all depends on the manufacturing process, however, some brand do make their treats flavored as to help trick our pups into eating them without a fuss. A strong herbal smell or test usually make dogs weary, and that’s why substituting that with a bacon or duck flavor can prove to be extremely helpful. Usually, companies make their treats take on the flavor of: duck, chicken, bacon, pork and a variety of other meats. If you have neutral tasting treats that your dog isn’t keen on eating, many owners turn the hide-treat-in-peanut-butter trick to trick their pupils into eating the kibble. While most treats are meant to just help with stress and anxiety problems that your pups encounter, some treats are also meant to help keep our pets healthy. Many brands nowadays try to avoid using the heating process when manufacturing their chews. This ensures that all the nutritional value and all the vitamins from the herbs used within are contained and remain undisturbed until they dissolve in the pup’s digestive system. This helps our dogs get the most out of every treat, ensuring that they are kept free of anxiety for as long as possible. 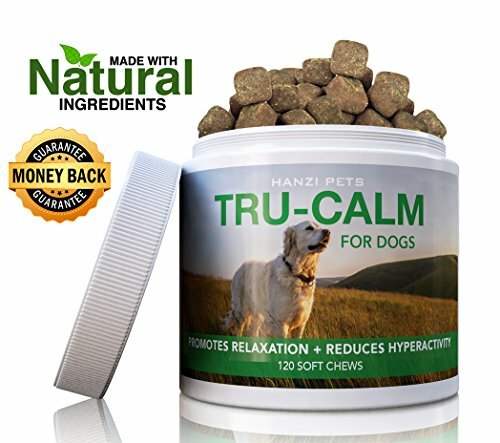 Most of the ingredients included within calming dog treats are very similar. They all contain the five, common herbs that help keep anxiety and aggression at bay, mainly: ginger root, chamomile flower, valerian root, passion flower and l-tryptophan. To help you get a better idea of what exactly these ingredients do to help your pup with anxiety, we did a quick overview of each one. The main benefit of giving ginger infused chews to your pup is the fact that it helps prevent upset stomachs and nausea. If your dog is known for his or her motion sickness, or sensitive stomach, then dog anxiety medication treats that include ginger extracts can greatly help reduce these kinds of accidents. Most of the time, ginger is used to calm digestive system problems, and that’s why owners who have pets with traveling issues flock to buying treats that included ginger. Ginger also reduces bloating, which is a build up of gases in the stomach from consumed food that for some reason can’t be expelled. Since bloating can actually be very risky and dangerous to large breed dogs, giving them treats with a regular dose of ginger can help greatly. Since ginger is also anti-inflammatory, it’s ideal for preventing early cancer symptoms, and inflammatory joint diseases such as arthritis. There is quite a lot of dispute over the fact whether valerian root actually significantly helps our pets or not. It’s definitely a popular herb and is used in medicine as an anti-anxiety herb for both pets and humans alike. Studies have shown that the root helps treat conditions such as epilepsy, thanks to its anti-convulsive properties. It’s important to note that valerian root is not suitable for all dogs. Some react better to it, some don’t react to it at all, while some have adverse effects when consuming it. This, unfortunately, all depends on the pet, and you won’t know until you apply it in action. It’s definitely ideal for pups with upset stomachs, but not so ideal for dogs that run hot, or are often itchy skin, since the herb is a warming herb. The root is by no means dangerous, however, some dogs may feel better and some may feel worse when taking it. The worst-case scenario after taking too much of the root is an upset stomach for a day or two. The chamomile flower is definitely a herb known to many. It’s often the go-to herb when we as humans are feeling unwell, whether that’s due to the dogs stress, nerves or an upset stomach. The same applies to dogs! 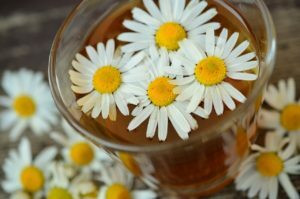 There are many varieties of chamomile, and the most widely used one is the German Chamomile flower. It helps soothe the digestive system, calm down aggressive behavior, heal wounds and get rid of any bacteria as well as get rid of worms in your dog. 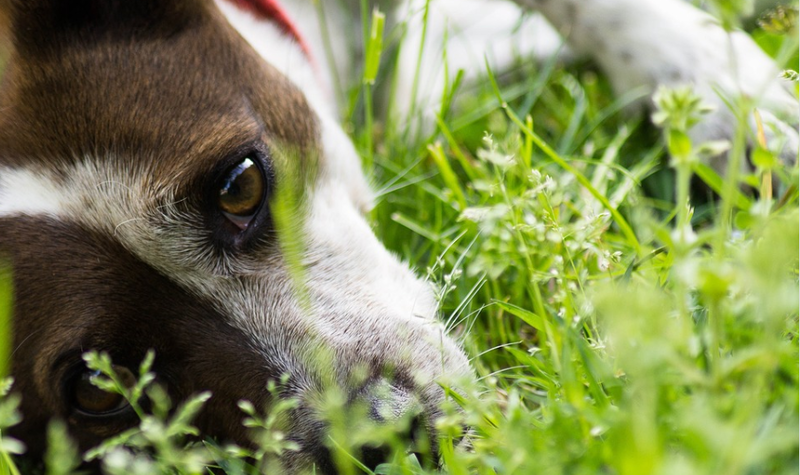 Since chamomile is a mild herb, you won’t have to worry about using it with your dog. It’s 100% safe, however, it’s important to note that just like humans, dogs can have allergies too. That’s why it’s important to start with small treat doses when giving your pet the new calming treats. This will ensure that if they are allergic, you will be alerted immediately before the allergy get worse. Passionflower is known for its various medicinal purposes. Mainly, it helps dogs keep calm during stressful events, such as thunders, firework displays, separation anxiety and much more. The flower is also known to help with dogs that have seizures since it significantly increases the GABA levels in the brain. Overall, passion flower is used with great success when used in anxiety medications. It helps improve the dogs’ mood and helps keep destructive behavior at bay thanks to it possessing properties that prevent important neurotransmitters from breaking down. This is why the flower helps with the temper, and keeps your dog’s agitation at healthy levels. Last but not least, we have l-tryptophan. This is one of the most important supplements since it can’t be produced in the body, due it being an essential amino acid. That’s why it’s important to regularly include it in your dog’s diet. To ensure that the l-tryptophan can regulate all of the dogs stress and anxiety that is nestled within your dog’s brain. Since l-tryptophan is a precursor for serotonin, it helps support your dog’s wellbeing in many ways. It can be hard to determine the general dose that you should give to your pet, since pet sizes vary and the size of the treats vary as well. Usually, the recommended doses for each pet-size are listed on the back of the tin. The general recommended dosing, however, for daily use, goes something like this: 2 chews for dogs that weight up to 25lbs, 3 chews for dogs that weigh up to 75pbs, and 4 chews for any dogs over 75lbs. Naturally, the bigger your pup the more you will have to invest every month. That’s why it’s also important to calculate your budget if you are planning on purchasing the supplements long-term. This will ensure that your pup will be covered when it comes to keeping calm during stressful moments. 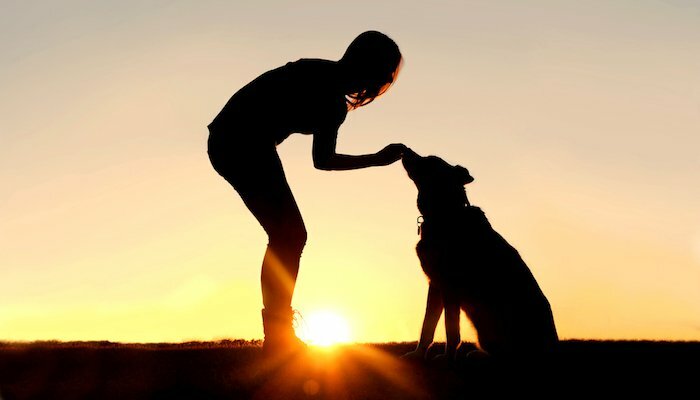 The best thing you can do to calm your pup down is give them a calming treat. If you know that you will be exposing your dog to stressful events, such as socializing, meeting strangers or going to loud places, it’s important to give them the anxiety medications (calming treats) at least half-an-hour before it occurs. This will ensure that the treat will have enough time to activate itself so that your dog can keep calm later on. Most customers experience great results with dog calming aid treats. However, just like with any product, some dogs just don’t react to them. It may depend on the breed or the dog, or many other factors, however, it’s not uncommon to find that some treats just may not work. This may either depend on your pup, or on the treats themselves. That’s why it’s important to invest and explore in a few brands before you decide that calming treats are just not meant for your dog. All dog calming treats made in USA are overseen by rigorous third-party inspections, tests and safety checks. This ensures that your dogs will only get the best, quality products that they need to grow up healthily. It is however important to first start giving your dog small doses of the treat in question before moving on to higher doses. This is vital, since some dogs may be allergic to the organic ingredients included within, whether that is chamomile or ginger, it’s better to be careful. If your dog doesn’t seem to show any allergy signs after the first week, it’s safe to consider that you can increase the dose, and hopefully, notice quicker results! Most owners see a noticeable improvement in their dogs’ behavior within two to three weeks of using the treats, that’s why it’s important to remain patient. Dog calming treats include a variety of different active ingredients, the main ones being: chamomile, valerian root, l-trytophan, ginger root and passion flower. Some treats are also given a bacon or duck flavor to help encourage your pets to consume them. The ideal calming treat foods for small dogs, in our opinion, are the Pet Natural Calming Chews for Dogs. They are specifically designed with small dogs in mind and are meant to help support your dog’s stress reduction. The treats are completely sugar-free, there are 20 in the pack and they are coated with a pleasant chicken flavor that any small pup will be eager to gobble down. The ideal treats to buy for your dog when travelling by plane are the Isle of Dogs Natural Chillout Treats. Thanks to the lavender extracts and the heart-shaped treats, this product couldn’t be more friendly looking. It’s ideal for calming your pet no matter if you are at the airport, on board or travelling through noisy areas. It can be difficult to deal with our pets when they are suffering from anxiety. It may feel like you are walking on pins and needles, trying not to agitate your pup in any way. Living in the same household as a hyperactive, anxious or agitated dog can be exhausting, and that’s why calming dog treats can be a great solution. 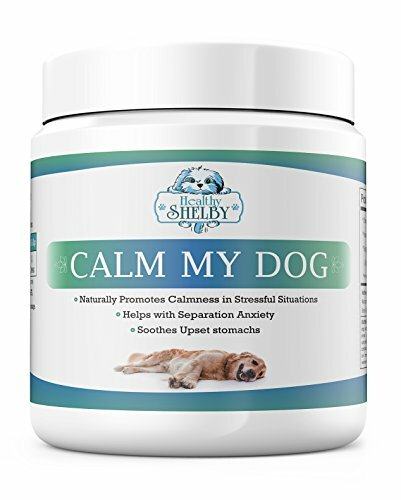 Not only can this natural calming aid treats help the owner get some peace, but they can help your dog learn to control their behavior better. Some pups just have too much energy and don’t know what to do with it, and express it by excessive barking, chewing, licking or biting. Calming treats are a great solution to help your pup deal with motion sickness, separation anxiety and stressful situations in general. We hope that our reviews and overviews will help you make a well-informed decision on what you should purchase for your pup! It’s best to start giving your pup the treat remedy for pets in small doses, this will ensure that if your pup is allergic to any of the ingredients, the side-effects won’t be dangerous or hard to deal with. For more tips on calming your pup click here. 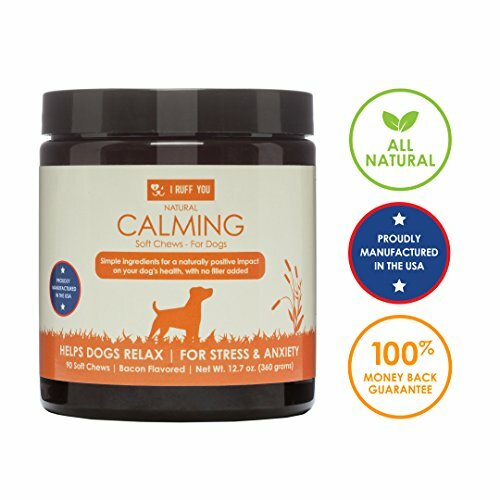 Most of the calming herbs that are used in the calming dog treats listed in our reviews (such as chamomile, ginger root, l-trytophan and passion flower) can also be used for treating human anxiety!